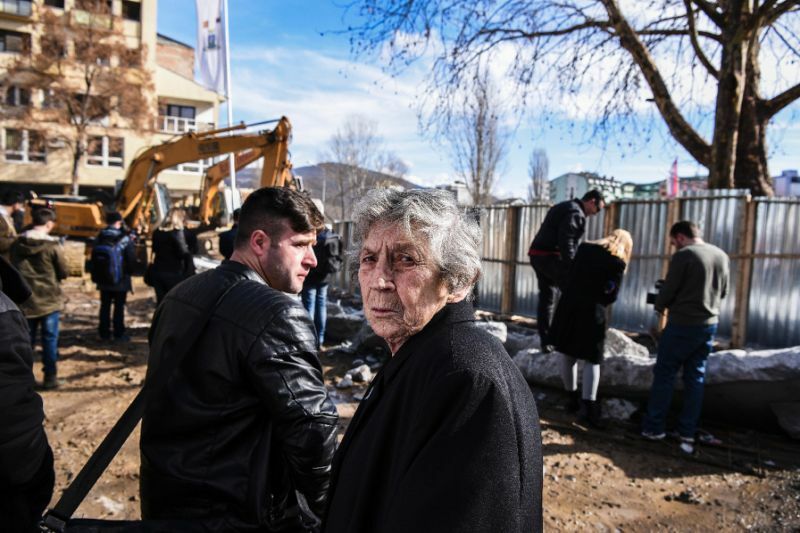 Kosovska Mitrovica (Kosovo) (AFP) - Serbs in the northern Kosovo town of Mitrovica on Sunday began tearing down a concrete wall on the banks of the Ibar river that had drawn the ire of the Kosovar authorities. The mayor of the city's Serb-dominated northern sector, Goran Rakic, had said the barrier was built last month to protect a new pedestrian zone near a bridge that connects to the southern zone, home to most of the city's ethnic Albanian population. But the two-metre-high (six and a half feet) wall, stretching some 100 metres, was seen by many as an effort to cement the town's divisions. On Sunday, two bulldozers were employed by a crew of workers to start knocking down the barrier, an AFP journalist reported. The move was the first evidence of a thaw between Belgrade and Pristina after weeks of strained relations, and came after EU-sponsored talks between leaders of the two sides in Brussels last week. "It's an extremely good sign, showing that both sides can reach an agreement given sufficient political will," said Nataliya Apostolova, the EU representative to Kosovo. Tensions had been running high in Kosovo since last month, when Belgrade sent a train towards Kosovo painted in the colours of the Serbian flag, bearing the words "Kosovo is Serbia" in multiple languages, and decorated inside with Serbian Orthodox imagery. Kosovo called it a "provocation", and the train was stopped from crossing the border over fears it would be attacked, according to Serbian Prime Minister Aleksandar Vucic. Members of Kosovo's ethnic Albanian majority were also outraged by the arrest in France in January of former prime minister Ramush Haradinaj, under an international warrant issued by Serbia. Belgrade wants to try him for alleged war crimes committed against civilians during the 1990s conflict. Kosovo's ethnic Albanian insurgents fought Serbian forces in 1998-1999. The former province unilaterally declared independence in 2008, but Serbia denies Kosovo's sovereignty.